A federal standard for regulating explosive gas in oil-transporting trains was rejected in the higher levels of the White House, according to a new report. It instead opted to allow new industry-backed regulations crafted in North Dakota to suffice. In September 2014, according to a Reuters exclusive report, Anthony Foxx, secretary of the US Department of Transportation, took to the White House to express concern over the increasing “bomb train” derailment disasters occurring amid the oil and gas boom in places such as the Bakken Shale region around North Dakota. Foxx was specifically focused on new rules for “light ends,” an industrial term for the mixture of combustible gas that is a high risk for DOT-111 crude-oil tanker trains, which haul 60 percent of the 1.2 million barrels of oil produced daily just in North Dakota. For example, in 2013, high vapor pressure in an oil tanker coming from the Bakken exploded in Lac-Megantic, Quebec, causing the runaway train to kill 47 people. Reuters reported that the Transportation Dept. had crafted an oil-train safety plan in July that aimed to heighten safety protocol of DOT-111 tanker trains, including tougher shells, slower deliveries, and better braking system requirements. Yet limiting the volatile gas cocktail was not part of the plan. The proposal was presented to White House chief of staff Denis McDonough, but the Obama administration ultimately decided to keep away, allowing a state rule approved in late 2014 in North Dakota to take hold. "The department had already identified issues with the characteristics of the crude oil, including vapor pressure, and had developed potential strategies related to the overall improvement and safety of the transport of the product and how the industry could treat it," a White House official source told Reuters. "Following the meeting, the Department of Transportation supported North Dakota on treatment of crude oil in the field," the White House official added. The North Dakota rule, however, has been panned by critics of current industrial practices. The measure’s goal “is to produce crude oil that does not exceed a vapor pressure of 13.7 pounds per square inch (psi),” billed as a way to limit the potential for explosions. But, as pointed out by DeSmogBlog, the new psi standard “will permit oil that is significantly more volatile than the oil in the Lac-Megantic disaster to continue to be shipped by rail.” Meanwhile, based on even industry (and regulator) crafted reports, most oil tested recently in the Bakken region already falls short of 13.7 psi, North Dakota’s new standard that will take effect next month. In addition, the state’s new rules do not strengthen vapor pressure testing standards, as they only call for “sufficiently trained” oil industry employees to test quarterly, eschewing an earlier proposal for independent lab testing. The new rules also indicated that state regulators have allowed companies to ship oil that contains high amounts of valuable, yet dangerous naturally-occurring gas liquids like butane. These components significantly increase the likelihood of an explosion. Recent oil spills from train derailments, like one that occurred in West Virginia last month, have underscored the risks that come with the current oil and gas boom in North America. Within the last two years, there have been at least 11 major derailments in the US and Canada that involved trains carrying immense amounts of oil, according to a December 2014 report by the US Congressional Research Service. From 2006 to April 2014, there were 16 high-profile accidents involving “high-hazard” trains carrying crude or ethanol, according to the US National Transportation Safety Board. In all, 281 tank cars have derailed, spilling nearly 5 million gallons of crude or ethanol, all resulting in 48 fatalities, Reuters reported. 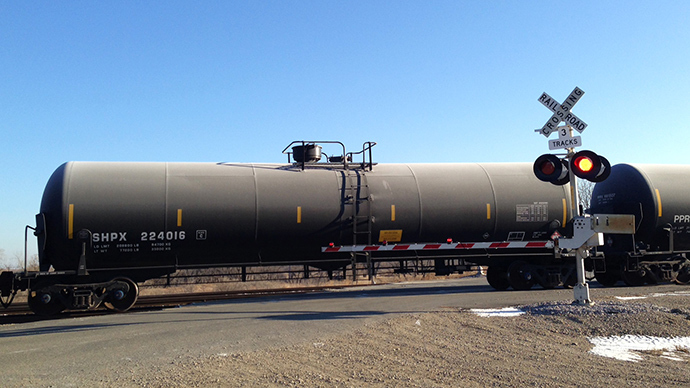 According to the National Transportation Safety Board, DOT-111 tank cars that carry crude and ethanol are not adequately equipped to carry flammable materials, and there is no requirement for the cars to have thermal protection against fire hazards. Efforts to address shipment safety are wrapped up in a fight over whether crude should be considered highly flammable or not, in addition to the questions over the future of DOT-111 cars. Liability issues have also hampered safety. Currently, common-carrier railroads must accept any cars that are of an approved design – such as the DOT-111 – all while they must assume the risk. Shippers, on the other hand, are free of liability burdens. In addition to train derailments that have felled toxic contaminants, there has been an uptick so far this year in other energy-development disasters, as RT has reported. In North Dakota, three millions of gallons of saltwater brine, a byproduct of hydraulic fracking, spilled in January from a ruptured pipeline near the Missouri River. A line in West Virginia transporting ethane exploded, and 40,000 gallons of oil spilled into the Yellowstone River from a ruptured pipeline in Montana. A natural gas pipeline exploded in Mississippi, and a second North Dakota incident set loose 20,000 gallons of brine.